More than 50 per cent of people at risk of malaria in Africa are now sleeping insecticide-treated nets. “The prospect of a malaria vaccine is great news. Information gathered in the pilot will help us make decisions on the wider use of this vaccine”, said Matshidiso Moeti, World Health Organization (WHO) Regional Director for Africa, in a news release. Announcement of the coordinated rollout comes as the international community marks World Malaria Day and the kick-off of World Immunization Week, 24-30 April, which celebrates the widespread use of vaccines that protect people against 26 diseases. Overall, vaccines prevent an estimated two to three million deaths each year, according to WHO. The injectable RTS,S vaccine was developed to protect young children from the most deadly form of malaria caused by Plasmodium parasites. 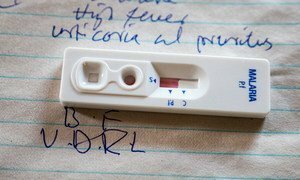 It will be assessed in the pilot programme as a complementary malaria control tool to potentially be added to the core package of WHO-recommended measures for malaria prevention. “Combined with existing malaria interventions, such a vaccine would have the potential to save tens of thousands of lives in Africa,” Dr. Moeti added. Africa bears the greatest burden of malaria worldwide. Global efforts in the last 15 years have led to a 62 per cent reduction in malaria deaths between 2000 and 2015, yet approximately 429,000 people died of the disease in 2015 – the majority of them young children in Africa. The WHO pilot programme will assess whether the vaccine’s protective effect in children aged 5 – 17 months old during Phase III testing can be replicated in real-life. Specifically, it will assess the feasibility of delivering the required four doses of RTS,S, the vaccine’s potential role in reducing childhood deaths and its safety in the context of routine use. The three countries selected to participate in the pilot were based on the criteria of high coverage of long-lasting insecticidal-treated nets; well-functioning malaria and immunisation programmes – a high malaria burden even after scale-up of LLINs; and participation in the Phase III RTS,S malaria vaccine trial.Each country will decide on the districts and regions to be included, with high-malaria-burden areas prioritized, as they are predicted to provide the broadest benefit. Information garnered from the pilot will help to inform later decisions about potential wider use of the vaccine. The malaria vaccine will be administered via intramuscular injection and delivered through routine national immunization programmes. WHO is working with the three countries to facilitate regulatory authorization of the vaccine for use in the pilots through the African Vaccine Regulatory Forum. Regulatory support will also include measures to enable the appropriate safety monitoring of the vaccine and rigorous evaluation for eventual large scale use. Gavi, the Vaccine Alliance; the Global Fund to Fight AIDS, Tuberculosis and Malaria; and the International Drug Purchase Facility UNITAID, are partnering to provide $49.2 million for the first phase of the pilot programme (2017-2020), which will be complemented in-kind by contributions from WHO and the British pharmaceutical company GSK . Having secured the funds for the initial phase of the deployment of the world’s first malaria vaccine, the World Health Organization (WHO) announced today it will be rolled out in sub-Saharan Africa and immunization campaigns will begin in 2018.